Tennis is a game of percentages. This is a losing one. The baseline is necessary. It’s also a mathematical black hole. Let’s start with the facts. The average winning % from the trenches leaves a lot to be desired. 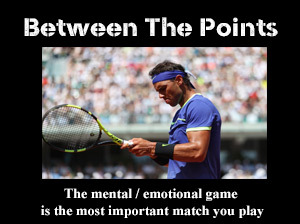 By far the number one strategy that dominates tennis is rallying. It makes sense from a social point of view. When you go to have fun with a friend, rallying perfectly fits the bill – lots of forehands and backhands across the net. It’s the right thing to do.